Foot Cardigan vs. Ozone Socks: The best sock subscription? A sock of the month club subscription is one of the best gifts you can buy for a friend, and also a simple personal solution for upgrading your sock game and staying up to date with the latest sock styles. Socks notoriously are lost in the wash and in the locker room on a regular basis for unclear reasons. A sock subscription solves many of these common issues that everyone faces, and in the modern era the convenience of eCommerce ensures a sock subscription can be a reality. 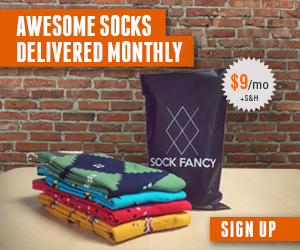 Now, more than ever, there are dozens of sock subscription sites to choose from. Here, we compare Foot Cardigan and Ozone Socks, two of the more popular sock of the month clubs. If you are into comedy, you’ll love the team at Foot Cardigan. They have an extremely fun personality — you can hear more by subscribing to the “Footsies Podcast”, which is hosted by the goofy Foot Cardigan founders. The socks that Foot Cardigan produces are under their own brand, and their variety of funky styles reflect their diverse personality. Comparatively, Ozone Socks keeps their fun sock of the month club quite simple — you trust their curation team to send you a new fun design each month. Foot Cardigan delivers a new pair of socks ever month, and their service allows you to choose the pair of socks you receive prior to delivery each month. On the other hand, Ozone Socks sends you one pair of sock each month but doesn’t give you a choice of the specific pair. This makes your life quite simple as they take all the hard decision making out of the sock buying process! Foot Cardigan charges a simple $9 per month subscription fee, and they offer to gift wrap your subscription for an extra $2 per shipment. Foot Cardigan offers free shipping, and you can save money by paying in advance (you also receive a free month with a year prepaid upfront). Ozone Socks offers two pricing options — a 6-month prepaid subscription for $75 or a 12-month prepaid subscription for $150. This equals about half the price of buying their socks retail. None of the Ozone Socks subscription plans auto-renew, and you can choose a subscription for either men or women. Ozone Socks and Foot Cardigan are positively reviewed by their customer base. Ozone Socks posts reviews on their website, and as of today they are showing 30 total reviews and an average rating of 5 out of 5 stars. Foot Cardigan has received positive coverage in major publications such as The New York Times, Buzzfeed, Shark Tank, and Forbes. Let us know in the comments — is Foot Cardigan or Ozone Socks the better sock subscription? We’ll let the readership weigh in (we assume you all wear socks!) In the meantime, give them a try (just don’t send us your smelly socks). Next Article Say it with a Sock vs. Woven Pear: best subscription socks for women?